Make a rhubarb-leaf-birdbath or birdseed-holder with these simple instructions. So many garden crafts and birdbath-projects are made out of leaves, and a birdbath made from a rhubarb leaf is such a popular item. It doesn't have to be huge either. Crafty gardeners make mini-birdbaths that are set in small garden spaces, or hang nicely from the limbs of small trees or posts. A well made "birdbath" can serve as a cute bird-feeder for seed as well. This recipe is extremely easy to follow, and certainly doesn't demand any materials out of the ordinary. You mainly have to decide in the beginning about the shape, and whether or not you would like it to hang from somewhere in your yard. Other than that, you are on your way. Decide on the size of leaf you would like to use. Make sure it is not ripped or torn, or pieces missing. It should be a nicely shaped leaf that is all in one piece. Add a little water to your sand, and mix it up until a bit moistened. Find an area on the property where your project won't be in the way or disturbed. Construct a pile of this moistened sand in the shape you would like. For this rhubarb-leaf-birdbath, your should have your sand piled and shaped like an upside-down flower pot. Cover over your sand with the saran wrap. You don't want the sand sticking to the cement. Form the leaf over the plastic being careful not to rip or tear it. The "good" side of the leaf should be facing downwards. Form an inch or so of sand up around the entire circle of sand all the way around the bottom to hold the leaf in place. In your pail, mix the portland cement 2 to 1. 1 part cement to 2 parts sand. Add water to make it nice and spreadable. Begin to cover the leaf with this mixture. Pretend you are icing a cake, and make sure to get the portland right down to the edges all the way around until it is at least 1/4 inch in thickness. It should be at least 2 inches thick in the centre of the mound. Now is the time to think about the wire, if you intend to hang this anywhere. Place the wire in the cement now before it begins to dry. If this is going to hold birdseed and hang, loop the wire in the centre, and make sure the wire is covered well in cement. Bring the edges of the saran up around the cement at the bottom, but don't put it directly into the cement. Leave it and let dry for at least 4 days to approximately 1 week. You can now pull the saran off, and the leaf should peel away nicely. A hosta leaf or caladiums (otherwise known as Elephant Ears) can be used also to make lovely leaf-birdbaths as well. 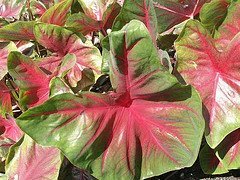 There are many species of caladiums to choose from.